Congratulations to MATGF and Stop Houston Gangs partner HPD, recipient of the 2013 IACP Webber Seavy Award for Quality in Law Enforcement. Gang-related crimes typically fall within the jurisdiction of state and local law enforcement. 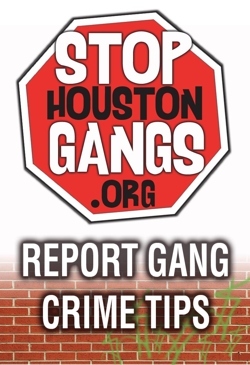 In response to the growth in gang membership nationally, several Houston based federal, state, and local agencies have joined forces and created the Stop Houston Gangs Task Force. 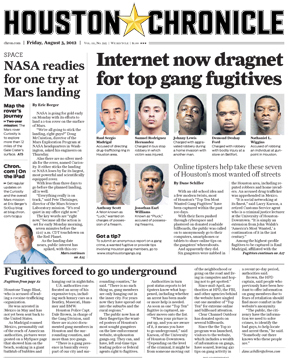 To disrupt and dismantle the most significant criminal gangs in Houston and the surrounding area. These fugitives should be considered armed and dangerous. Never try to apprehend a fugitive yourself. Contact law enforcement for assistance. The act of engaging in criminal activity as a structured group is referred to in the United States as racketeering. Once a gang shifts from turf wars and organizes illegal activities with a money focus they have crossed the line and can be classified as an Organized Criminal Enterprise. There are some facts you need to consider before you join. Disclaimer: Images and symbols displayed in tattoos on this website may not be gang affiliated and in fact may represent legitimate entities such as sport teams and ethnic groups. Most people don't want to admit that gangs and violence exist in our home towns and sometime in our own families. If we don't educate ourselves you on what's going on we can't help our sons, daughters and friends. Talking about the problem is the first step to fixing it. If not, we know one group that will listen to your children - gang members. Click here to see the status of tips submitted over the last 90 days. Crime Stoppers of Houston will pay up to $5,000 for information leading to the arrest or charging of any felony suspect.